This book together with associated software serves as an introduction to microwave network analysis, microwave components and devices, and microwave circuit design. 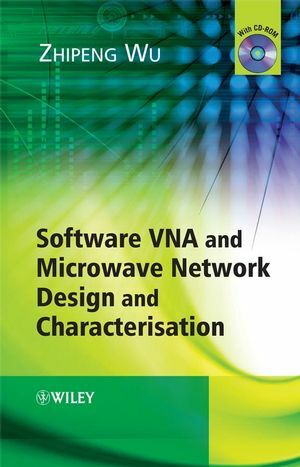 Software VNA and Microwave Network Design and Characterisation also provides both device and circuit simulators powered by the analytical formulae presented in the book. The book consists of chapters on network analysis theory and network parameters, installation and functions of the software, built-in device models, circuit design and operation principles and design examples. a trainer for users to gain experience of how a VNA would operate in practice. Capability of accessing to the data on a commercial VNA test instrument. device simulator equipped with 35 device builders from which an unlimited number of devices can be defined and studied. circuit simulator that can be used to build circuits and study their properties. Software VNA and Microwave Network Design and Characterisation is a practical guide for senior undergraduate and MSc students as well as practising engineers and researchers in the field of microwave engineering. Zhipeng Wu is currently a Professor in the Microwave and Communications Group in the School of Electrical and Electronic Engineering at the University of Manchester. His research interests are in the field of antennas and propagation for wireless and mobile communications, tomographic systems and sensors, and microwave engineering, and he has taught many courses on these topics including Masters courses in microwave measurements and communication systems, and senior undergraduate courses in microwave components and systems and communication principles. He has been at the university since 1998, and was elevated, in 2005 to become a Senior Member of the IEEE and Fellow of the IEE. He has been invited to be a program committee member of a number of international conferences, and will the Chair of the Technical Program Committee for the International Workshop on Antenna Technology in 2007. He has co-authored the book Radiowave Propagation Over Ground (Kluwer, 1993) and the accompanying software to this book, and also the vector network analyser (VNA) software for the proposed book. Along with this, he has written a chapter in the Wiley Encyclopedia of RF and Microwave Engineering (Wiley, 2005), and the book Dielectric Resonator Antennas (Research Studies Press, 2003), and authored over 120 conference and journal publications.